If you thought you were thinking about ditching last week, I can't imagine how you're feeling now. I can't promise you this will be a fun first period, but I can promise you this will be on the final, so pay attention. Class is officially in session. This was such a miserable effort on both sides of the ball, it was legit hard to pull any highlights. Like what do you want me to show on you offense? James Wiggle White ran a nice wheel route and Tom threw a dime to hit him in stride on third and eight inside the red area. That was our only tuddy, and possibly the only good play the offense made. I could show you Sony Michel running into straight into the line, who were getting pushed into the backfield like they were tackling sleds, but again, no one is showing that highlight. 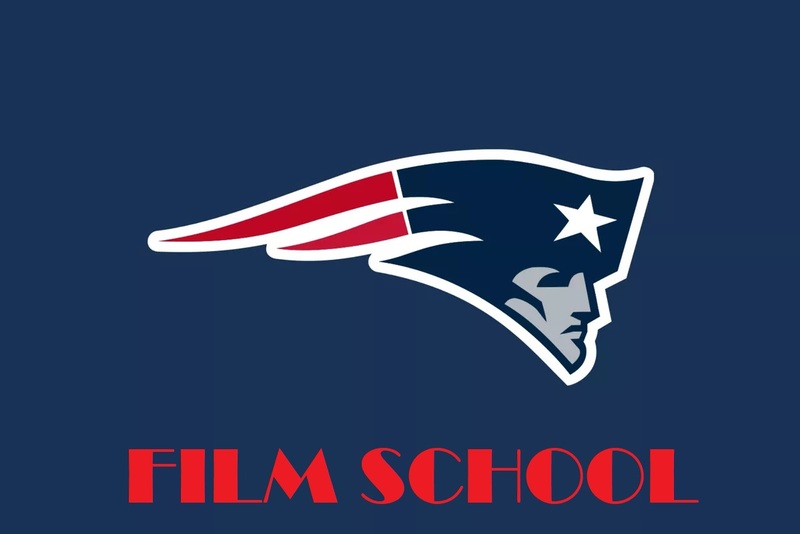 I could show you Tom's pick, but I refuse to ever speak of it again. I could show you Patterson returning a kick off 45 yards, but that would require me acknowledging he is on this team. I've done, and will do, a lot of disgusting things, but that is not one of them. So lets leave the offense out of this for now. They don't seem to want to play football so we aren't going to waste our valuable class time learning about whatever it is they are doing. On defense, as I noted in my drunken ramblings, the one guy I thought bounced back from the Jags game was Bentley. This is a big time play at a time in the game when we desperately needed one. At the snap, you have two WR left, at the top of the screen. The running back is lined up in shotgun on the strong side as well. In coverage you have J-Mac playing traditional corner on one of them. Then you have Bentley motioning that way, but behind him Cyrus Jones sits there playing a shallow safety. Duron Harmon sits further back in a traditional safety role. Both receivers are going to run a skinny post. 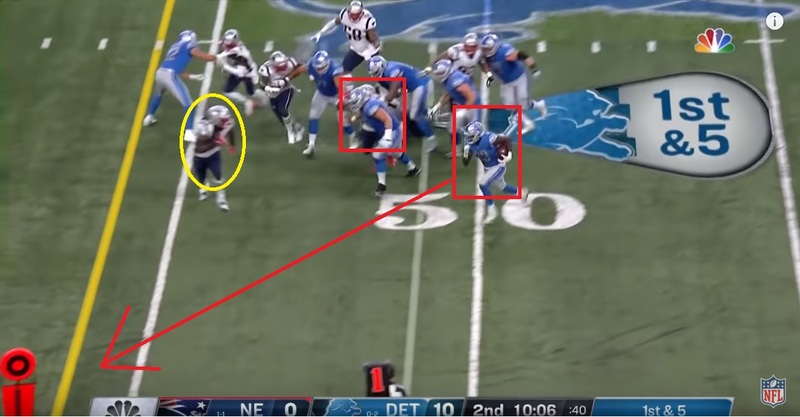 If you're Stafford here, you expect J-Mac to run with the outside one, Cyrus to pick up the inside one, and then Harmon to make a decision to double one of them deeper in the route. Bentley will race to the backfield to pick up the releasing running back. Instead, we send Cyrus into the flat to cover the back, which means we're asking Bentley to get 20 yards off the LOS down the seam in coverage. This is good scheming, confusing the QB pre snap, but it takes a lot of trust in your linebacker to compete on the route. Harmon jumps up to double the outside route when it cuts in allowing J-Mac to take his place deep and outside. (Correctly by the way, something we didn't do on the long Marvin Jones tuddy over Gilmore.) So again, Bentley is on an island. Stafford sees this matchup and knows that's where he's going. I'm going to ignore Fillingsworth's analysis in this case, even though he may be right and a long, arced pass could result in six here. I'm ignoring it because this is a results business baby. 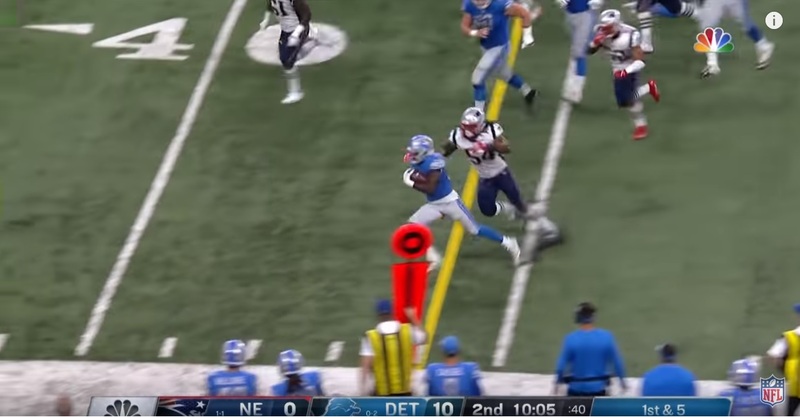 And the fact is Stafford thought he could drop a low liner into his receiver's lap over a helpless Bentley and for that he paid the iron price. Bentley stays right on the hip of his guy, gets his head around to the ball, and makes a play. Coming out for the second half we definitely needed a wake up call and Bentley delivered. We would turn that into a tuddy of our own and even though that was the closest we would get all night, that felt like the play that was going to win us the game. But when you get pumped 26-10, there are going to be more bad defensive plays than goods, so unfortunately we must shift our attention in that direction. With a plethora of problems to discuss, I'm going back to the issue I keep saying is giving me the most night terrors. My man HIGH. First and five, after an offsides, the Lions come out in shotgun. From top to bottom thats Davis, Bentley, Guy, Shelton across the line. In yellow, Elandon Roberts is going to blitz, reading the play and then firing downhill at the line. Something he does very well. 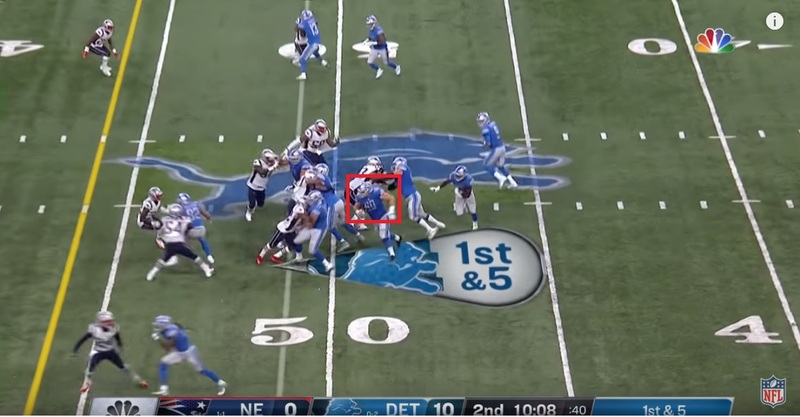 HIGH and Dev, both circled in red, are going to bracket Lions TE Luke Wilson. Great. The lions run across the formation. Guy gets some good penetration but the running back can escape quickly enough. Davis for sure and Bentley to a degree have a tall task, coming from the back side of the run, so they fight in pursuit. Shelton is on his way to be pancaked, not ideal, but the bigger problem is HIGH. He's doing his job at first, but the play recognition is slow. Luke Wilson isn't even running a route anymore. He's into the second level on the way to sealing off Dev with a block. The pulling guard is coming around the edge, (in red) looking to get into the second level himself and block HIGH, but HIGH hasn't even turned around yet. But whatever, eventually HIGH does turn around and sees what he's got in front of him. The back is trying to turn the corner. In red we can see where he's headed. And also in red we can see he's about to outrun his pulling guard, who is now out of the play. So it's HIGH vs the back, mano y mano. And from the looks of this screen grab HIGH is taking the perfect angle to cut him off before the first down. The HIGH I know wins that race a billion times out of a billion. It would be one thing if he was coming off of a knee injury, but a torn pec?? What gives? HIGH is a big dude, and he's not the fastest linebacker on the field, nor do we need him to be, but if he can't make these plays we have a serious problem on our hands. Prediction: No turnovers for the offense. Result: Please don't make me talk about the pick again. I can't do it. I won't do it. Darius Slay isn't real. It's all a figment of my imagination. I got so greedy with that MVP last year. Now we throw for 100 yards with a pick in week 3 and I feel like the race is over. But that's not the trophy we care about!! Be better, JO, be better! Prediction: We sack Stafford 3 times. Result: 1 sack, Stafford picked us apart, and we allowed a 100 yard rusher against the Lions who couldn't run 100 yards on a track. WRONG. Prediction: Josh Gordon will play but won't be targeted. Result: I don't even want to count this as correct because he didn't even suit up. He was warming up on Sunday with guys that would be playing so I was kind of shocked he sat out. But I stand by the fact that a lot of people were saying look for a big day out of Gordon, and there was NO CHONCE that was happening. 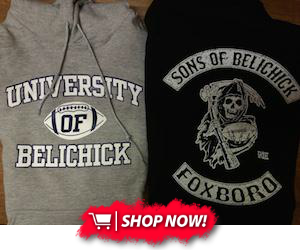 Prediction: Pats win a blowout 34-20. Result: The only part of this that was correct was that the game would only be close at the opening kickoff. Unfortunately it went in the wrong direction, but make no mistake about it. We got DUMMIED on Sunday by a very bad football team. Go beat Miami and all is forgiven. Still ain't worried about a thing.